Give us a call or drop us a line and we’ll talk you through it, but in a nutshell: we’ll find out from you what kind of work your employees do and therefore what exercises would be most beneficial. All our yoga classes are tailored to different companies’ and employees’ needs, i.e. how much do they sit, travel, stand, carry heavy loads. Is there a tendency towards back issues and other musculoskeletal disorders; are employees prone to certain work-related injuries; are there any weight management initiatives? Once we have established this, we can make sure that you get the utmost benefit out of the yoga sessions we teach. 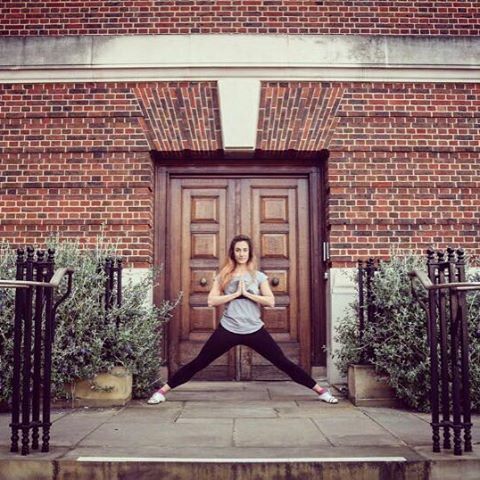 If you’re interested in regular office yoga classes, we’ll aim to organise a free trial session (to be reimbursed when signing up with us) so you can see us in action rather than let us tell you what we’re all about. If you’re after a one-off yoga session, for example for your staff health and wellbeing week, yoga for client events or anything similar to the packages below, talk to us for more details. We will hold our yoga classes in one of your (meeting) rooms or simply at your desk. No space is too small for us and no time too short. And all you need to bring to the session is yourself. If you’re more of a thinker than a mover and you fancy something a bit less active, or if you’re simply not convinced yet, let us show you how yoga and mindfulness can take your staff wellbeing to the next level. With topics ranging from “Building Resilience through Mindfulness and Pranayama” to “The Benefits of Yoga for Parents and Children”and “Sleep Management”, we offer a variety of one-hour talks around health and wellbeing in the office and we’re happy to create bespoke presentations for you. Just get in touch for more information and a quote. We have chosen Dhirendra Brahmachari’s lesser known Suksham Vyayam as our signature yoga for offices, especially for those yoga sessions after which you’ll continue your workday. Every part of the body is taken into consideration. Going from top to toe, the kriyas move from a mental focus down the body, targeting the smaller as well as larger muscle groups. 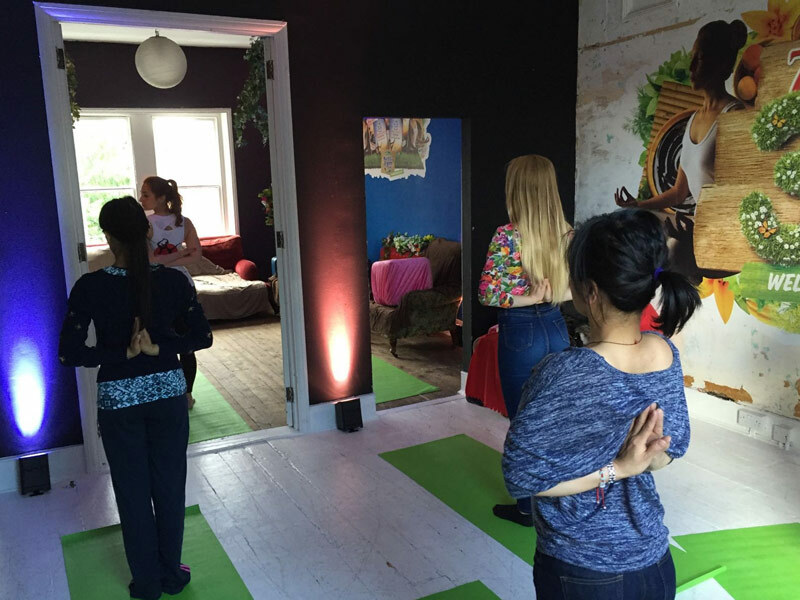 Our sessions also include Pranayama breathing and meditation. We aim to energise as well as ground you, leaving body and mind perfectly prepped for work and enabling you to continue relaxing and unwinding at home. For those of you who prefer your yoga class to be similar to the one in your gym down the road, we also teach traditional Hatha, Vinyasa and Ashtanga Yoga. Where other teachers tend to separate the different styles, we are keen to show similarities and interdependences. Our vision is to make employees healthier overall. It’s important to us that our clients are able to incorporate our weekly exercises into their daily office routine. That is why we always recommend that our corporate packages include some desk & chair yoga. This doesn’t mean that you have to have a yoga desk or yoga chair! It just means that the exercises are performed right at the workstation: some of them involve sitting on a chair and others incorporate the desk. That way, the exercises can easily become part of a short break, which does not have to involve you leaving your workstation. We also take care to teach enough “unobtrusive” exercises, which no employee should feel embarrassed about doing in an open-plan office where other people might be watching. We suggest a cardio-intense yoga session to companies whose office facilities include showers, because you should sweat! For offices without showers, we recommend a cardio session to be at the end of the day, so people can shower at home. Cardio yoga is very popular with corporate employees who like their tough workouts, but don’t always have the time to go to the gym due to their workload and office-based commitments. The individual exercises we teach are comparable to for example burpees in that it doesn’t take more than a minute to get you out of breath and your heart rate up. They combine concentration, movement and accelerated diaphragmatic breathing in order to achieve not only a high intensity workout, but also an efficient exchange of oxygen and carbon dioxide that will leave you relaxed and refreshed for your day at the office and your evening of winding down. A lot of people don’t realise they don’t breathe properly, which can cause a lot of mental as well as physical issues. We teach the efficient use of clavicular, intercostal and diaphragmatic breathing as well as the importance of prolonged exhalation for de-stressing. Our essential breathing sessions are good for corporate clients who get nervous before meetings, presentations or any other type of situation that stresses you and worsens your breathing pattern. We practice a particular set of Pranayama breathing techniques which the employees can resort to whenever such a situation arises and whether they’re alone or in an open-plan office. The yoga on the go sessions are perfectly suited to employees who are out of the office a lot due to their work involving a great amount of travelling and/or working remotely. Yoga on the go addresses the particular challenges that come with that, and our set of non-office-based exercises can be performed anywhere, be it at an airport, a train station or just outside your car. The mindfulness & meditation exercises are especially good for very busy employees who feel like they never get a break. When we use these terms, we simply mean taking some time out of your busy office day in order to concentrate on yourself, your breathing and your body, and being fully present in the moment. Our approach to meditation is non-religious. We guide our corporate clients through various visualisations or body scans, giving them the opportunity to observe rather than judge their thoughts and feelings. Our meeting prep yoga closely ties in with the meditation and breathing sessions to tackle nervousness and also focus on those parts of the body that might be particularly challenged in meetings due to long spells of sitting, standing, writing etc. These meeting prep yoga sessions can be extended one-on-ones with an individual corporate client, or they can be group sessions in an office meeting room in breaks as short as 15 minutes. The invigorating stress-buster sessions tend to be shorter (15 to 30 minutes) and we often start them with some energy-releasing noisemaking, before focussing some quick high intensity movements. We typically follow this with active stretching and end with breathing exercises. If you have an open-minded team, we’ll add some laughter yoga, guaranteeing you reduce your stress levels through activating your parasympathetic nervous system – whether you laugh for real or you fake it. For our stress-buster sessions, we tend to recommend an office meeting room, so as not to disturb employees who don’t participate. Ever wondered how to make sure your employees bond properly in those “never know how much they help” team-bonding sessions? We have some great tricks up our sleeves that will make sure they share a fun time. Through concentration exercises or laughter yoga, we make sure everyone will come out of the session feeling good about the people they work with and happy about their workplace. Whether you’ve got a fun and loud team or your office is very heads-down and quiet, we’ll manage to get you to a state of incessant deep belly laughter which you might find absurd to begin with but which will morph into an effective release of all sorts of positive neurotransmitters and feel-good hormones – and before you know it, you’ll be out of your overthinking mind and in your relaxed body, where we should all spend a little more time, rather than taking ourselves too seriously. In our computer ergonomics sessions, we teach you how to adjust your posture, your hardware and your workstation in order to minimise musculoskeletal disorders such as carpal tunnel syndrome or other repetitive strain injuries associated with desk jobs. Have booked a nice location for your corporate away day and are looking for something interesting to fill the time? Choose from any of our packages above, and we’ll come to wherever you are. We’ll fit our yoga sessions into your away day and we can even throw in some healthy home-cooked Indian snacks afterwards. Want to shake up your event with something a little bit different? Offer your staff or clients some free yoga to make sure they stay happy and love your company. Whether it’s at your office or an external location, we can work anywhere and we don’t need any props. Regular yoga sessions don’t really fit into your company concept but you do run staff health days? Or possibly in addition to your weekly yoga sessions, there is one day that is all about health and wellbeing? If you’re looking for fun and healthy activities to fill the day, please get in touch. We’ll show your employees some unusual yoga moves and breathing which they can take back to their desks and practice afterwards. In our sleep management yoga classes, we combine yin yoga poses with a focus on mindfulness-based meditation and pranayama to get you to calm down and control your breath. We recommend taking these 30-minute sessions on a regular basis in order to achieve the most effective and lasting results. And if it’s not for your company that you’re looking, we also offer yoga outside of the workplace – private one-on-one sessions in your home as well as workshops and retreats for groups of people in various locations. 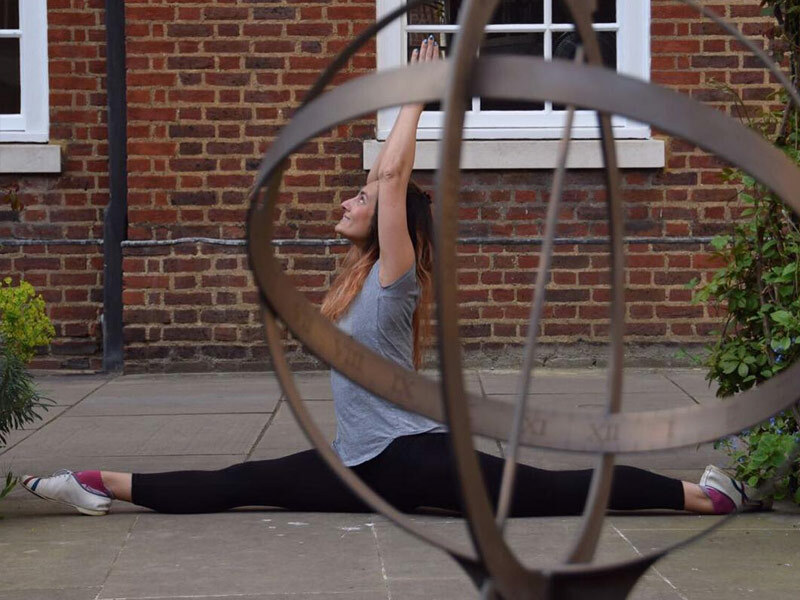 Whether it’s just you and you’d like your instructor, in-class private and personal adjuster to come to your home and teach you one-on-one, or whether it’s a small group of you and a friend or partner, we come to your location of choice for a bespoke private yoga session to fit your needs. Sometimes, doing yoga regularly but for a limited amount of time still isn’t enough. Sometimes you want to get away from the stresses of everyday life for just that little bit longer and not only relax and unwind in another environment but go somewhere where no one needs anything from you. This yoga retreat could be on a summery Spanish island or a wintery retreat in the French mountains, to name just a couple of choices. Or somewhere in the UK, beautifully tucked away from the big cities. Our yoga retreats will take you into another world. All you need to do is book, turn up and we’ll do the rest. We’ll take care of your physical and emotional wellbeing and send you back to your everyday life, relaxed and prepared to take on all those challenges with a new frame of body and mind. Our yoga and mindfulness workshops are designed not only to get you to practice the postures and breathing exercise but also to give you some more background knowledge about yoga, its origins and benefits as well as related philosophies and how to best work these into your life. You should emerge from these afternoon- to weekend-long workshops not only more relaxed but also with a fuller understanding of the bigger picture and how to adapt it to you personally. Whether you’re an individual or a team of athletes, are training professionally or just for fun, yoga will help increase your stamina, flexibility and muscular control, thereby improving your performance as well as preventing and treating injuries. Footballers, cyclists, runners and swimmers – get in touch with us and we’ll create a bespoke offering for you. In our children’s yoga classes, children of all ages learn and enhance their body and breath awareness. With parents’ involvement, children will not only reinforce the natural, correct way of breathing and holding themselves, they will also learn coordination skills as well as holding poses and calming themselves down, thereby getting empowered to handle frustrations and stresses by themselves. Our classes for children are 30 to 45 minutes long and can be arranged on a one-to-one basis as well as for groups. Who pays for our wellbeing services? Mostly, the companies pay us on behalf of their employees and then we charge per session and not per participant, but we also have individual options. Usually, we speak to HR managers, office managers, health and wellbeing managers or event managers, but if you’re an individual who thinks office yoga could be great for your company, we’d love to hear from you, too. Sessions start from as little as £60 for registered charities. Prices are per session length, not per individual and we can teach as many people as the space comfortably fits. Give us a call to request our price list and find out about our peak and off-peak prices, including our regular and one-off yoga packages for example for your staff wellness week. Our expert talks start at £800 but these prices can be reduced when you’re booking a package of regular classes with us.